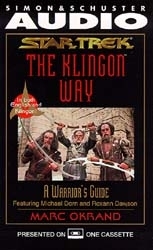 For many years, Klingons have been the premier warriors in the galaxy. Regarded across known space with fear and awe, few beings understand the true depth and greatness of the Klingon culture. "Four thousand throats may be cut in one night by a running man." Noted Klingon language and cultural expert Marc Okrand collects the wisdom of these great warriors, taking proverbs and quotes from some of its greatest thinkers and bringing Klingon philosophy to lesser races across the galaxy. Marc Okrand is a linguist who created the Klingon language heard in several Star Trek films and television series. He is the author of three books.